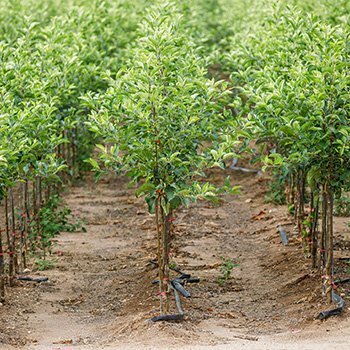 Our many years' experience running a nursery is the foundation for your apple growing success. 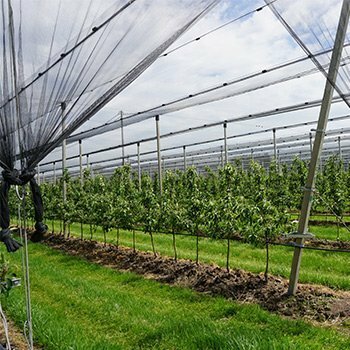 Owing to our know-how, we have been able to increase our yearly production to about 2 million apple trees. We don't just supply our customers with the "apple tree" product but also with the knowledge we have acquired. We offer the best possible mutations of the classic varieties such as Gala, Fuji, Golden Delicious, Red Delicious and Granny Smith as well as the best seedlings of new and innovative apple varieties such as Redlove, a scab-resistant club variety with red flesh. Furthermore, we offer different categorisations. In addition to one-year-old trees and Knip trees, we also have Maxi-Knip trees. These are apple trees to which we have awarded our protected "Maxi Knip" Seal of Approval – i.e. trees with at least 12 useable shoots and some other advantages. We obtain all the grafts we use exclusively from the owners of the variety or mutation, from reliable graft mothergardens or from our own graft mothergardens. No sapling resembles another. That is why we classify them based on their properties. By doing so, we reach different quality categories.